Our anchorage in Royal Island Harbor. Nice to be in settled water. Our anchorage at Cherokee Point was fine until the wind died out. Then we were at the mercy of the tides. The waves constantly rocked the boat sideways making Duwan ill.
We left Cherokee Point on Great Abaco Island at 11pm Sunday to head southeast for Eleuthera. We wanted to travel during the night to make sure we arrived in daylight. We sailed the first few hours. Our local wind was light but there must have been weather to the northeast, because we had high waves coming from that direction. About the time the wind died out Duwan decided she needed to lie down. I motored the next 35 miles. After the sun rose, the breeze came up long enough to trick me into raising the sails. But it died again once the sails were up. By 10:30am Duwan felt good enough to steer us through the Egg Island pass and toward our anchorage in protected Royal Island Harbor where we dropped the hook at noon. 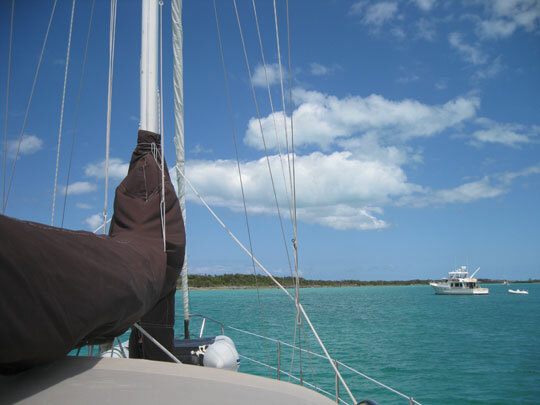 This entry was posted in Life on the Water, The Bahamas. Bookmark the permalink.